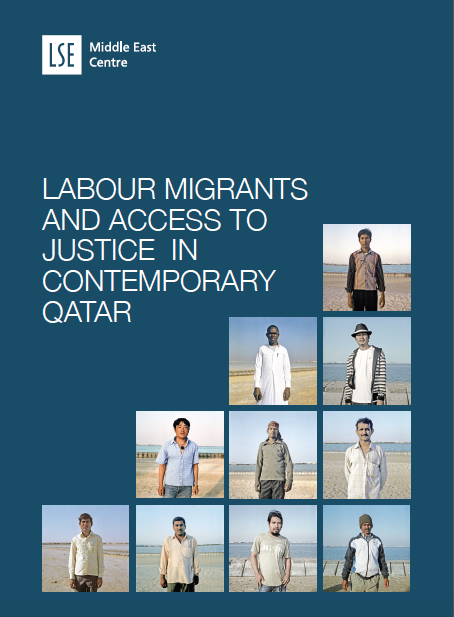 Time, language and mobility are the key deterrents to migrants accessing justice in Qatar, according to a new report–Labour Migrants and Access to Justice in Contemporary Qatar–released today. Andrew Gardner of University of Puget Sound, lead author of the report and an expert of labor migration in the GCC, spoke to Migrant-Rights.org on the systemic issues facing migrants and obstructing access to justice. “It is interesting, from what we see, that if they (migrant workers) can get to the finish line, justice seems to be delivered.” But, as the report reveals, only a small percentage those who seek justice do reach the finish line. The report illustrates how Qatar's system for processing and adjudicating migrants’ grievances is extremely difficult for migrants to access and navigate; co-authored by Silvia Pessoa and Laura Harkness, the ethnographic study recounts the lived experiences of migrant workers who have sought legal redress. Qatar certainly does not stand as a model of success in addressing these challenges, but I think we’re also looking at a very new and rapidly developing context." The report identifies the three primary players in a migrant’s legal journey: the Department of Labour Relations, the Labor Court and the Ministry of Interior. Other institutions are also important, particularly embassies, which are usually the first points of contact for migrants in distress. However, the embassy’s mandate is not always clear. On this statement, Gardner doesn’t quite agree. “Embassies weren’t a central focus of our project, but they were an important element in many of the stories and experiences we collected from migrants seeking justice in the system provided by the state. I recognize the idea that embassies are largely concerned with ‘economic diplomacy’ to be generally true, but I think this reflects the geopolitical inequalities that characterize our contemporary world. And over the years, there have been several ambassadors and other diplomats who’ve certainly pushed the issues of rights and justice to the fore in Qatar. The inability and incapacity of migrants to move about urban space should be conceptualised as a systemic impediment to justice." Qatar’s judicial system came under fire earlier this year, when Gbrelia Knaul, the UN Special Rapporteur, criticized the justice system for failing to uphold basic human rights. After meeting with senior government officials, judges and representatives of civil society. Knaul expressed concern over access to justice in Qatar for women, migrants, and domestic workers. Additionally, Knaul called for more transparency and less executive involvement in the judiciary, especially in high profile cases. The report also highlights a problem faced by most migrant workers: extreme isolation. “This location (the labour court in West Bay) is also far away from where most low-income migrants live. The official language of the Labour Court in Qatar is Arabic and language interpreters are provided based upon necessity and availability. Interviews with migrants and experts portray the Labour Court system in Qatar as a financially costly process in which cases may take several months to a couple of years to reach conclusion. This makes workers very hesitant about filing lawsuits against their employers. At present, there are no laws that oblige the Labor Court to require employers to pay subsistence money to workers for the period of the lawsuit. “The interests of the state and that of the migrants overlap. It helps both to break the inefficient of the judicial system,” says Gardner who has suggested incremental changes that make a difference. The report was launched at a round table organised by Qatar University’s Centre for Gulf Studies. Over a couple of hours, experts and officials discussed the report under Chatham House rules. Some experts felt the report glossed over the exploitative nature of the Kafala system. One local expert in particular felt the recommendations (see below) made were ‘weak and disappointing’ and failed to address the basic character of the justice system, which evolved in an era that does not reflect contemporary Qatar. Some members of the round table added that sometimes diplomatic missions' political and economic interests override the interests of migrants, because of which embassies of sending countries do not forcefully represent the cases of migrant workers to host countries. An official at the discussion added that problems are not encountered with big companies, but only with the smaller ones. He also stressed the need to protect the interests of employers who invest a lot in recruitment and training. The Department of Labour Relations and the Labour Court should coordinate to implement a monitoring programme to generate an internal understanding of the issues that foreign migrants face in the justice system. This monitoring programme could track a portion of the cases or complaints filed in these typical entry points to the justice system, and thereby generate a better understanding of why many complaints and cases are dropped. The Labour Court and the Department of Labour Relations should ensure that basic translation services are available at all important junctures in both the Labour Court and the Department of Labour Relations. The population of foreign labour migrants in Qatar speaks more than twenty different languages. Few speak English, even fewer speak Arabic, and a portion of these migrants are illiterate. While the comprehensive provision of translation services is a formidable logistical and bureaucratic challenge, it is a vital juncture in the carriage of migrant justice. At the current juncture, prioritization should be given to Hindi, Urdu, Nepali, Malayalam, Tamil, and Bengali. The Labour Court, in coordination with the Ministry of Justice, should significantly increase the speed with which migrants’ cases are processed and adjudicated. Migrants interviewed for this project reported timelines to justice that often exceeded a year. Facing a bureaucratic justice system, the process for informing sponsors and/or employers, time spent waiting for the sponsor and/or employer to attend hearings, and an understaffed court system, the justice system could be readily expedited in a variety of ways: these institutions could be expanded, the process migrants follow in the justice system could be restructured, and/or special dispensation for migrants to pursue other work while their cases are active could be established. Migrants should have the ability to seek other remunerative work when they have active cases. In the kafala, labour migrants who file cases against their employers cannot legally work in a different job while their case is adjudicated or in process, except in those rare cases where the Ministry of the Interior grants a release (the common term for a no-objection certificate, or NOC). For migrants, filing a case often means attempting to survive in Qatar without income or finding illegal employment. This latter option exposes migrants to other vulnerabilities. Facing this dilemma, many migrants opt not to pursue justice because of the long timelines involved. Both the Department of Labour Relations and the Labour Court need more punitive measures at their disposal, and both need to implement those measures. These punitive measures can potentially resolve several recurring problems in the justice system. Foremost, with these punitive measures, sponsors, employers, or their proxies would be strongly compelled to attend required hearings and negotiations. Additionally, settlements adjudicated by the Labour Court should include penalties that dissuade employers from continuing to withhold salary. Across the board, stronger punitive measures would ensure that more employers comply with the Labour Law. Provisions in the Labour Law that deny labour rights to domestic workers should be removed and domestic workers should be able to utilize grievance mechanisms of the Labour Court and the Department of Labour Relations.